Fiction – paperback; Orion, New Ed edition; 184 pages; 2004. Translated from the Italian by Christopher Woodall. Somehow the Colombian knew he was fucked the moment he met the cop’s gaze. 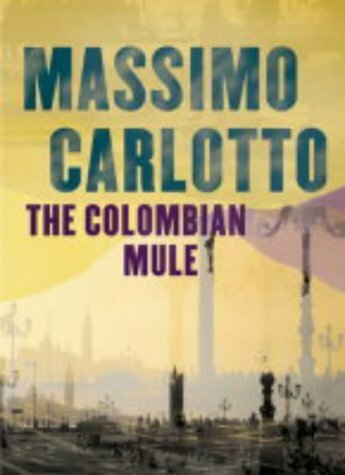 So begins Massimo Carlotto’s hardboiled Italian noir novel The Colombian Mule, which opens with Arias Cuevas being detained at Venice airport with a belly full of cocaine. When Cuevas describes his drug-smuggling contact — “about fifty, medium-height, a bit fat, with light brown hair” — the Italian police arrest the wrong man. Is it a case of mistaken identity, or are the police bending the law for their own means? Enter Alligator, an unlicensed private investigator, and his band of borderline-corrupt cohorts, who wants to discover the truth behind the arrest and bust the drug smuggling ring in the process. But in this seedy underworld peppered with shady characters — greedy, violent and immoral — the normal rules of engagement do not apply. Set in Venice and the grimy industrial surrounds of Mestre, this short but action-packed novel delivers a deftly woven storyline that blurs the line between those who break the law and those who enforce it. It is a dark, violent but ultimately compelling novel told in a clear, succinct style that grips from the first carefully measured word. It’s a great shame that only two of the Alligator series have been translated, so far. I enjoyed TCM too. This is the 4th book in the Alligator series by Massimo Carlotto. Master Of Knots is the 5th. I too wish that they’d translate the 1st 3, because the characters & storylines are excellent, involving, interesting & exciting. His other 3 books, The Goodbye Kiss, Death’s Dark Abyss (both novels), and The Fugitive (basically an autobiography about his time on the run internationally, from a crime he didn’t commit, and the subsequent time spent in prison for it once he was betrayed) are all excellent too. His writing style is fantastic, and I put him alongside Andrea Camilleri for giving you a real feeling of being there. Anything by these guys, along with Lorenzo Carcaterra cannot be highly recommended enough by me!